farmer's smokehouse - Räucherspezialitäten PFAU - original Black Forest smoked specialities. The slow maturing of the full-bodied aromas is one of the secret methods in the natural curing process of PFAU smoked specialities. The process of smoking for preserving foodstuffs was discovered by our ancestors. 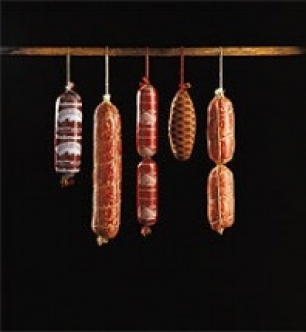 The smoked Black Forest specialities, PFAU's fine smoked ham and smoked sausages such as ham salami with only 4.7 % fat content, farmer’s bratwurst, ham sausage, Vesper sticks (suckling pig sausage) or Kirschwasser salami and Zapfen salami with rum ... manufactured from the best local, organic young beef ... come into the traditional farmer’s smokehouse. 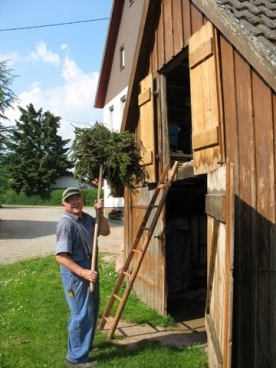 Freshly cut sawdust from pine and spruce - typical of the Black Forest - is strewn over the floor of the smokehouse to produce the strong aroma. On top of this comes juniper brushwood which lends the smoked products its full-bodied smoked juniper taste. After only a short time the meat begins to take on the aromatic smoked taste and its unique mild and full-flavoured aroma begins to unfold. 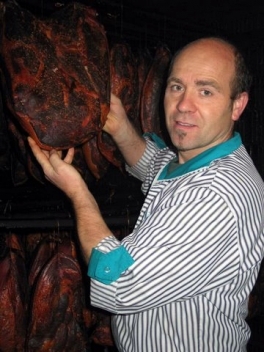 PFAU's fine smoked ham hangs in the smoke for a total of 14 days. During this time it loses approx. 30 % of its moisture content. This reduction in weight is gladly accepted because it contributes to the refinement of PFAU's fine smoked ham. This is followed by 5 weeks resting and storage time in the curing room. 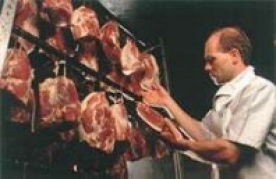 This is where the taste becomes absorbed completely; the ham becomes tender and robust. 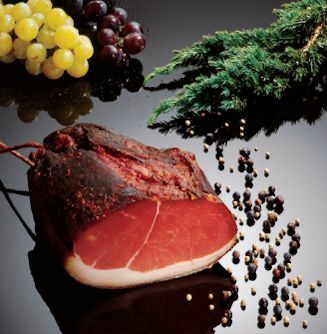 A real ham speciality, award-winning "PFAU's fine smoked ham"
It is also optimally suited for storage over a longer period of time and always has a tasty aroma. The traditional peasant smoke will give our dishes the archetypal and full-bodied flavor from the Black Forest. 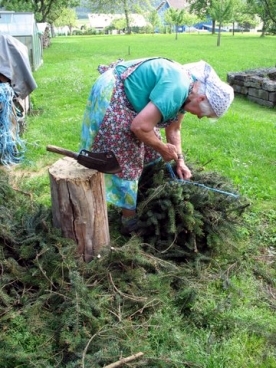 The brushwood is valuable from our neighbors or prepared especially for us.